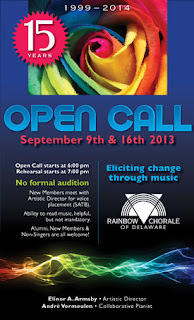 Delaware Arts Info: The Rainbow Chorale of Delaware is BUSY BUSY BUSY! The Rainbow Chorale of Delaware is BUSY BUSY BUSY! The Rainbow Chorale of Delaware's schedule in the coming month is quickly filling. Starting with an Open Call for singers on September 9 & 16 and rehearsals already under way for the epic performance they're presenting with local supergroup IN THE LIGHT — a stellar night of music by QUEEN at World Cafe Live at the Queen on Friday, September 13 (see details below). Get your tickets for this one, soon, folks. If In the Light's previous performances are any indicator, this will be sure sell-out! Out-of-this-world Wilmington rock band, IN THE LIGHT, will perform two full sets of Queen's music, giving full tribute to Queen’s rich orchestral-rock sound. 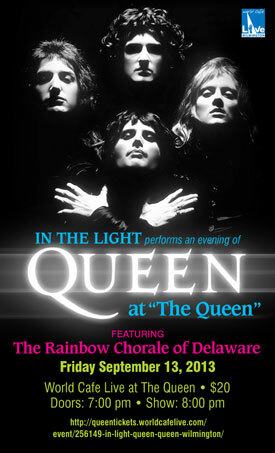 The Rainbow Chorale will be prominently featured throughout the show. Song selections include, I Want It All, Who Wants to Live Forever, Killer Queen, The Prophet's Song, Fat Bottomed Girls, Somebody to Love, and of course, Bohemian Rhapsody plus many more.